Visiting professor, successively at The Australian National University, Institut d’études politiques de Paris (Sciences Po), and The University of California, San Diego. 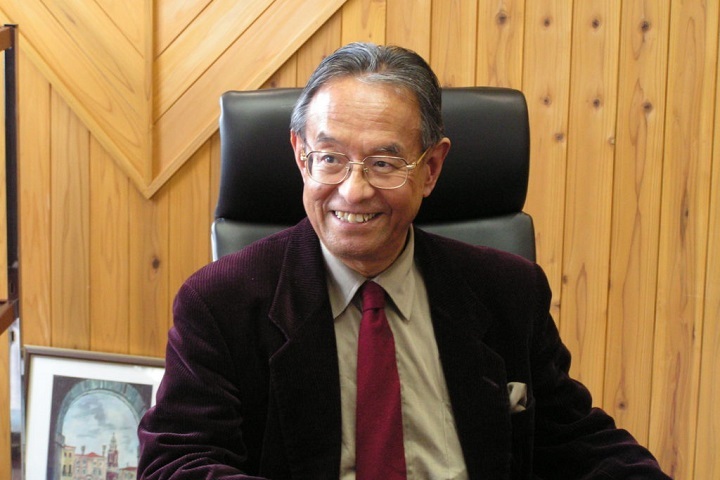 AIU Library was renamed “Nakajima Library” in 2014, in memory of his great contribution to the university’s foundation and progress. He enjoyed playing the violin, climbing, and painting watercolors as his hobbies. Two years ago in fall, after the 6th Japan-Soviet Round Table Conference in Moscow, I took a one-day excursion to Lviv, which is a medium size city with a population of 700,000, located near the border between Poland and western Ukraine. It had a feel that was vaguely similar to a European Medieval city than the Soviet Union. The Theatre of Opera and Ballet, which was built in 1990 with a Neo-Renaissance style, is located in the center of this city. I would say that it is almost the same but smaller than the Theatre of Opera in Paris. I watched and enjoyed the whole performance of "Swan Lake" that night. During my free time the following day, I finished this sketch hastily and roughly while the other members of my group enjoyed shopping. This became a memorable piece of mine. I had several occasions to visit France during the last two decades with the support of the KAKENHI grant from the Ministry of Education to conduct collaborative projects with scholars of Contemporary Chinese Studies. While in France, my wife and I went for a drive to Normandy with my longtime friend, Dr. Claude Cadart and his wife, and a great scholar of Chinese Studies and Asian Studies Professor Leon Vandermeersch, and his wife. It was over 10 years ago, but I still remember that we departed Paris early in the morning that day, enjoying the smell of spring in Normandy with white apple flowers and yellow jonquil narcissus in full bloom, and feeling delight from singing the lyrics of a chanson song "Ma Normandie" in French without any difficulties, which I learned in my young days. It was far past noon when we arrived in the fishing port, Honfleur, which is located close to the mouth where the Seine River flows into the English Channel. Honfleur is a typical harbor style city but with a unique harmony of medieval and modern, such as the countryside and city, wooden English Sainte-Catherine Church vaulted ceiling that is built like a boat and old clock tower, stone-paved streets and fancy souvenir shops. All of these characteristics made the city very attractive. The best part was that the scenery of the wharf, the countless small fishing sailboats and yachts at anchor, and buildings in the background that were old and tall, with some even tilted or bent. Honfleur is a location where impressionist painters often chose for their art, such as Corot and Dufy, as well as a venue to hang out. There is an art museum in the center of the city commemorating Eugene Boudin, who Monet respected as a lifelong mentor. Recently, while I was acknowledging the superiority of Boudin's nature description in an exhibition in Tokyo, I also got a sense that the atmosphere of Honfleur would fit the music of composer Erik Satie, who was born there. He often played the piano at pubs in Montmartre, Paris, at the end of the former century, rather than for Monet's beauty. It is kind of a similar episode to that of Utrillo, who was Satie's mother’s husband, at one time, who was loved as a model by many painters in Montmartre. I did not have time to paint during my first visit there, so I wished I had another opportunity. A couple years ago during spring break, I had a business trip to Paris on a Japan-France collaborative research project and was lucky to have a one-day excursion to Lisieux, which is close to Honfleur, and water painted the wharf of Honfleur. The scenery was so colorful and vivid that I had to use my green and blue paints as it is. And this painting became one of my masterpieces which I hung in my study at home.